Dhaani called Viplav and tried talking to him. Viplav said hello and asked her to move to network catching place. Just then he heard Kamini’s shout and disconnected the call. Viplav saved Kamini from the river and asked her to wake up. 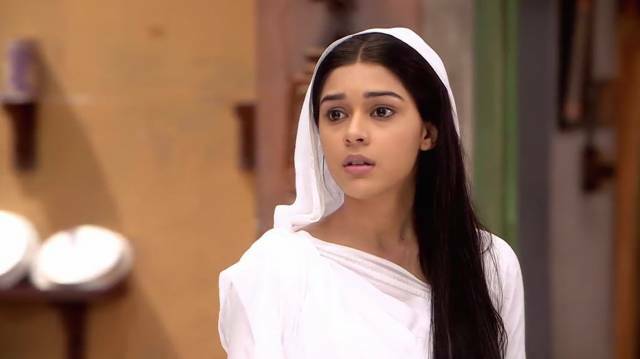 Dhaani worried for Viplav and Kamini. She thought to inform Dadi bua then thought of her promise made to Kamini. Dasharath came singing a song. Dasharath looked at Dhaani and was about to keep his hand on her shoulder, just then Kanak called him. Dhaani and Dasharath turned back to look at Kanak. They were shocked to see her in colored saree. Dasharath struggled for words to explain to Kanak. She asked Dhaani, what she was doing there. Dasharath said he was searching for Sushma. Dhaani informed them that Viplav and Kamini were in trouble as she heard the latter’s scream. Kanak asked her not to make an issue. Dasharath said maybe there would be no network. Dadi bua came and looked for Kanak. Kanak said she was telling Dasharath that she has learned so much from her. She asked her to wear colorful sarees and would live her unhappy life happily. Dadi bua told Dhaani that Viplav was not a kid and said she might have heard her heart scream because of jealousy. Dhaani stated that they were in trouble. Dadi bua asked her to rest. Dhani went. Dadi thought that ‘d be nice if they spent time together and Viplav would realize who diamond was. Dasharath told Dadi bua that he wanted to talk to her. Dadi bua went without talking to him. Dasharath said, Kanak, that she was white blood woman. Kamini gained consciousness and saw goon near her. She pushed him. Viplav said it was him, Viplav. Kamini said she was feeling bad and asked about the ring. She said it was her protection. Viplav asked her not to worry. He said the car was outside. Viplav and Kamini sat in the car. Viplav said car’s radiator was burst. Kamini said she would call Dadi Bua. Viplav told his phone had fallen into the river. He took her inside. Kamini stared him romantically while the song Sun Saathiya is played. Viplav lit the fire and sat near that. She thought if that was a dream, how to stop herself from going closer to Viplav.